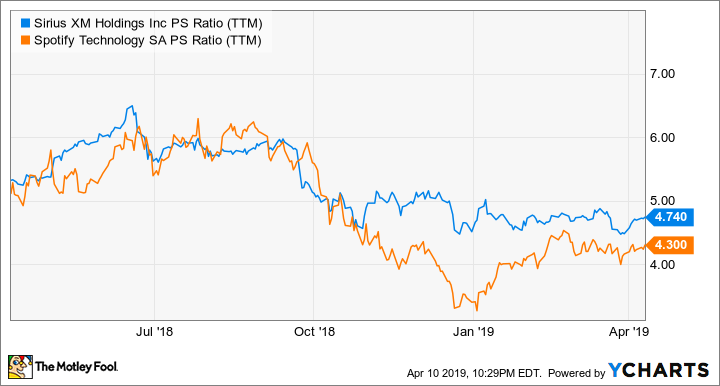 Two leaders in this field are satellite radio company Sirius XM Holdings (NASDAQ:SIRI) and Spotify (NYSE:SPOT), the first mover in internet streaming. Spotify, the hot new company on the scene, had its IPO just one year ago. However, Sirius has proven itself to be a long-term survivor, with a virtual monopoly in satellite car radio after merging with XM radio in 2008. Sirius also just complemented its streaming offerings by purchasing Pandora Media in an all-stock deal, which just closed in February. In contrast, Spotify is foregoing profits for the sake of grabbing as many subscribers as quickly as possible. Subscriptions tend to be relatively "sticky" businesses, so spending to capture subs, even at the expense of near-term profits, is the correct strategy. Spotify grew revenue at a 28.6% rate in 2018, much higher than Sirius, though Spotify posted an operating loss of 48 million euros. However, that was still a big improvement over the prior year's 378 million euro loss. The above chart might lead one to believe Spotify has had to cut prices in order to grow subs. However, that's not totally accurate. The lower ARPU has more to do with: 1) more family subscriptions, which are bigger in terms of absolute dollars but lower on a per-subscriber basis, as well as 2) foreign-currency headwinds. Spotify only gets 37% of its monthly active users from its home continent of Europe and 30% from North America, whereas SiriusXM primarily operates in the U.S. and Canada. In addition, even though Spotify's ARPU is declining, the company has rapidly grown its subscriber count and importantly, gross margins. Spotify has managed to expand gross margins from 14% in 2016 to 26% in 2018. That's a hugely encouraging sign and points to a much more profitable future as the company continues scaling. While both companies are primarily distribution platforms, each company also has some amount of proprietary content. For instance, SiriusXM has an exclusive deal with radio shock-jock Howard Stern, as well as several other sought-after radio personalities. Sirius is also able to stream television audio such as CNBC, ESPN, and CNN, which you normally wouldn't be able to access via AM/FM radio. Spotify, by contrast -- and one of the reasons why I've been cautious on the stock -- doesn't have much in the way of proprietary content over other streaming services, though the company is trying to change that. During 2018, Spotify began striking deals with independent artists. However, the number is currently small, and Spotify will have to negotiate this new venture without damaging its relationships with the powerful record labels. Usually, it's the higher-growth company that should have a higher P/S ratio, but Spotify is actually cheaper on a price-to-sales basis. Conservative investors will likely opt for SiriusXM due to its more stable profits and modest 0.8% dividend. However, Sirius isn't exactly screamingly cheap, at 23 times earnings. In that light, growth-oriented investors should prefer Spotify. One year after its IPO, Spotify's current share price has cooled to $143, just a tad above its IPO price of $132 and well below its 52-week high of $199. Meanwhile, the company has impressively grown subscribers while also expanding gross margins. Though I'm still a bit nervous about some risks, Spotify is the more exciting play here.